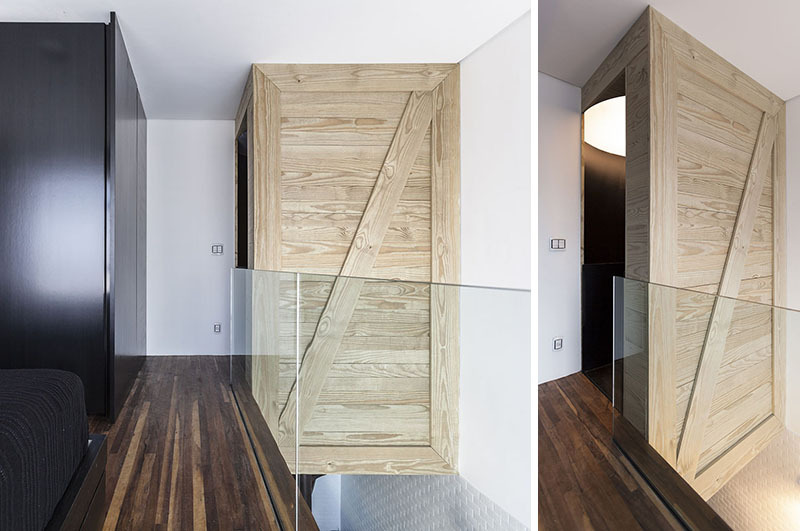 Although this apartment is small, it boasts a stunning spiral staircase! When dealing with a small space, there are different ways to do your layout. This has a great impact to how everything will turn out. This has an effect on how your space will be accessed from different areas and how you would feel comfortable while in it. And if you have an upper level, it might be challenging especially if the ceiling is low or if there is a small space for the staircase. But you don’t have to worry because there are actually many staircase designs that works well in small areas like apartments. 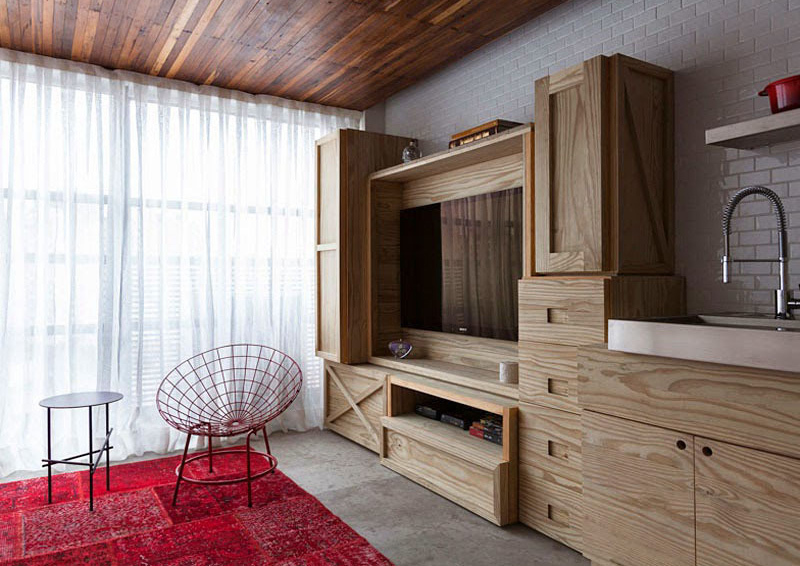 Today, we are going to show you a small apartment located in Sao Paulo, Brazil. It is designed by Alan Chu which has a very nice design with different combination of materials. This apartment has an open floor plan for the living and kitchen area. It also has spiral stairs that lead you to the mezzanine level of the apartment. Aside from being an access to the upper level, the stairs in here is also a sculptural element in the space especially that it is colored black. 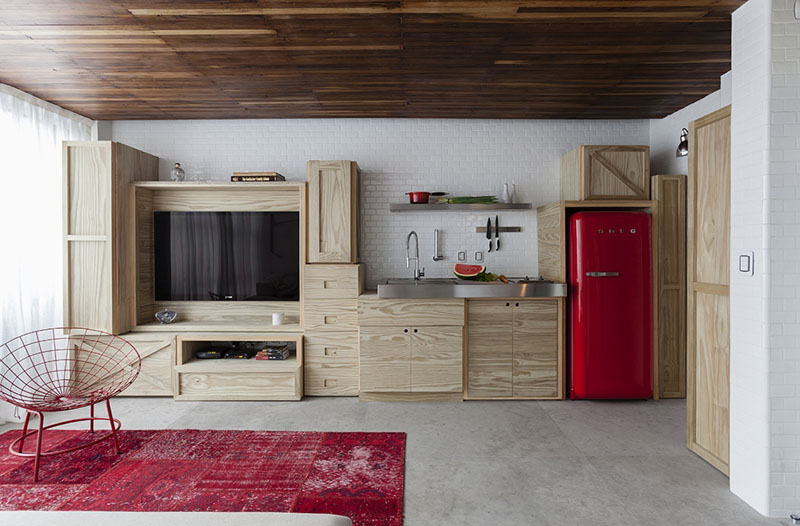 There are also space-saving cabinets in the area which is of course perfect for a small apartment like this. Let us take a look at this apartment through the images below. Unique feature: This apartment has a combination of wood and bricks as well as a black spiral staircase. 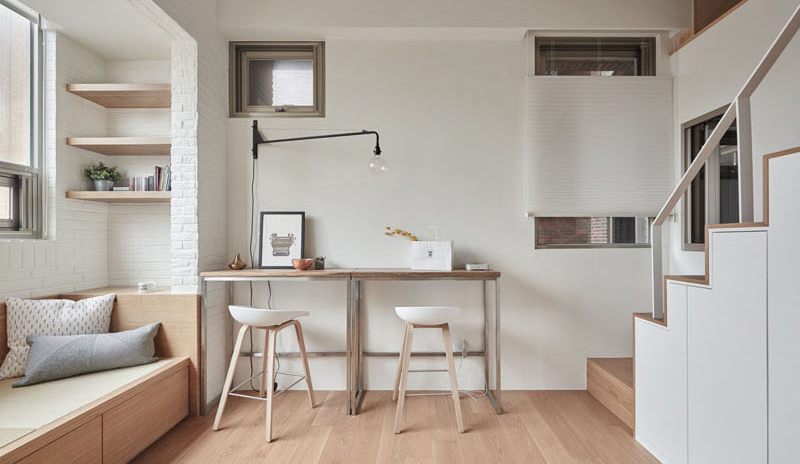 At first glance, I fell in love with this apartment because it seems to have everything I want for a home like the white subway tiles on the wall, the transforming wooden cabinets and the staircase. This is the main area of the apartment which can be seen as soon as you walk into it. Along one side of the apartment is custom built cabinetry that’s home to the entertainment unit and the kitchen. Isn’t it nice to have a wall system cabinet like this? A closer look at the part of the cabinet which is located at the living space of the house. Notice that the interior has a wooden ceiling, subway tiles on the wall and a concrete flooring. At the end of the wall of cabinets on the right side is a red SMEG fridge which has a classic retro appeal. 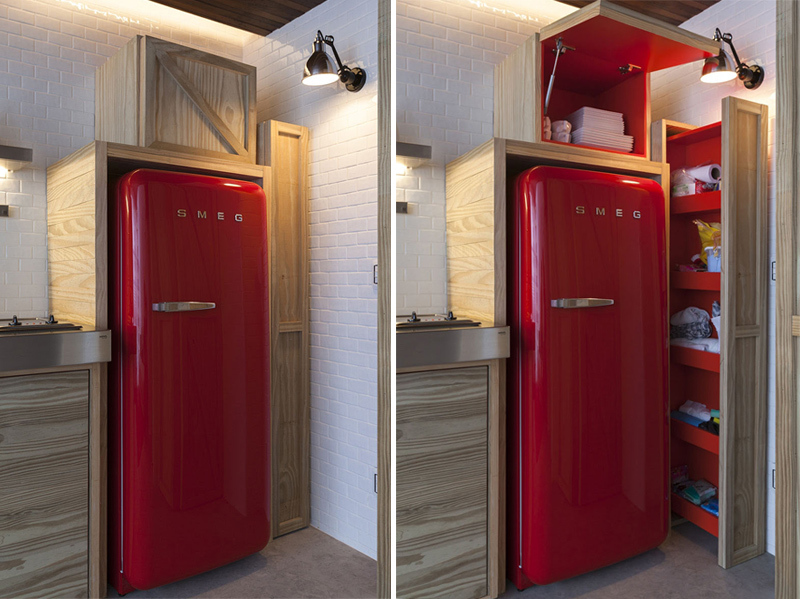 What is hidden within the surrounding wooden boxes of the cabinets are bright pops of color that match the fridge. Who would expect to see a lot of storage like this? Seen here is the sleeping area which is located in the same space with the living area and the kitchen. It also has the white walls as well and a comfy bed. This is the bird’s eye view of the bed which looks inviting because of how soft it looks. It also has a long overhead lighting in it too. On the mezzanine, one can see another bedroom. 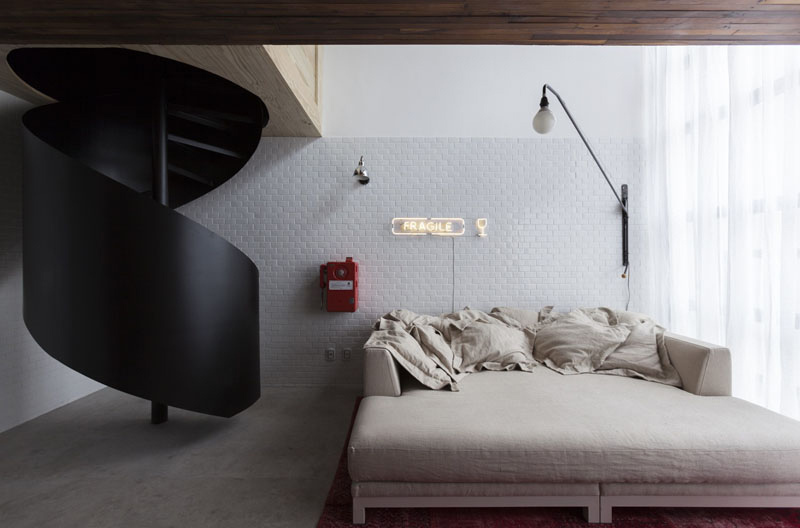 It has a large space that make a dedicated area for the bedroom which features a black wall and bedding matching the black spiral staircase. 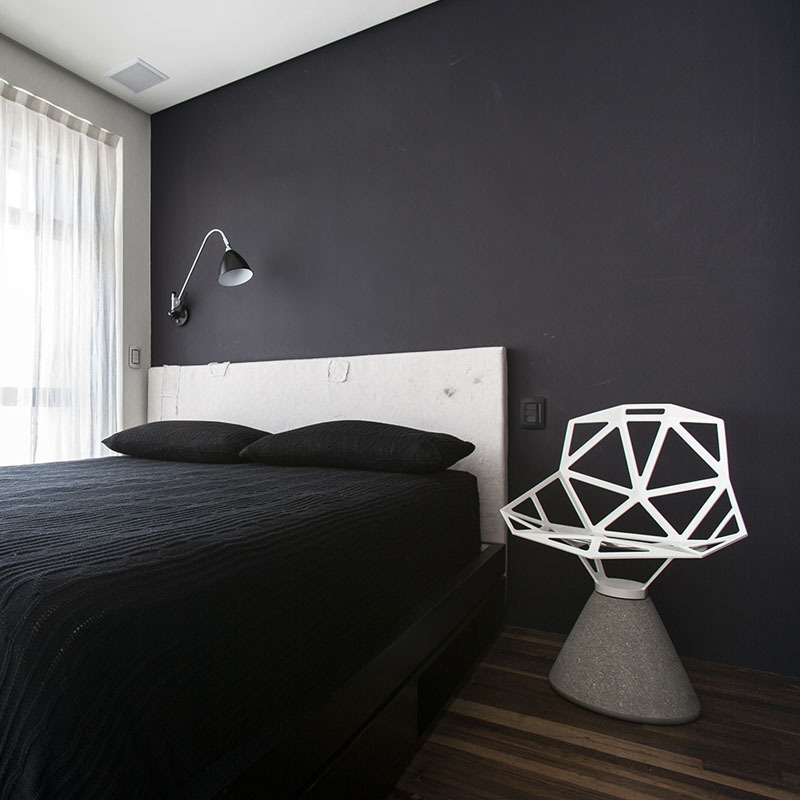 Notice also the beautiful and almost futuristic design of the chair on the side of the bed. The top of the spiral stairs is wrapped in wood which is the same materials used for the wall of cabinetry downstairs. It has a bright circular light that makes it easy to see when climbing the stairs at night. Opposite the stairs is the bathroom that also has black walls. For sure, you’ll never run out of ideas when it comes to home interior because we really have a lot to show you. And if you are looking for a certain design for a house, then here is another one that will not just give you ideas but will also give you inspiration as well. 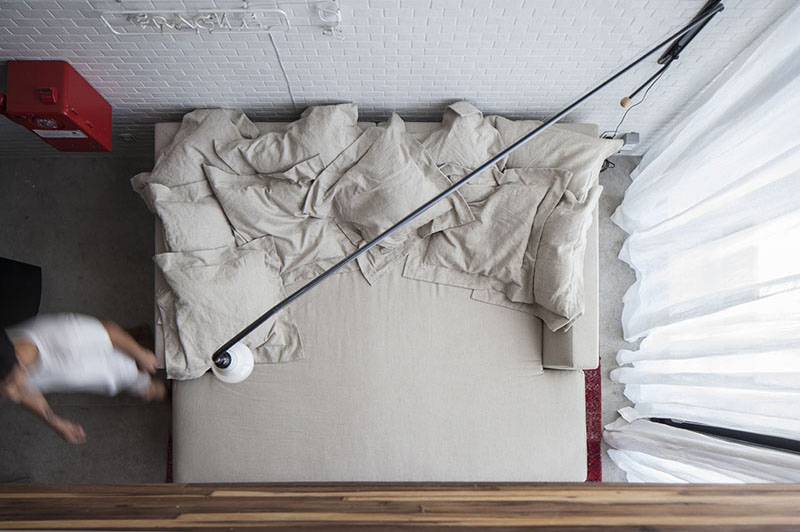 This interior is designed byArchitect Alan Chu who was able to make use of space creatively. As you can see, the layout is well done and everything is placed in a certain area that will not crowd the home. Even its storage spaces are very impressive. How about you, what can you say about this home?